The electrical generation, transmission, and distribution system has been labeled the most complex machine ever created by humans. There are many rules and regulations to ensure that it runs reliably, and as a result the process for interconnecting your energy project with this system involves dealing with regulatory agencies at the state and regional level as well as utility personnel, engineering consultants, and lawyers with experience with interconnection contracts. It can take over a year to complete the required interconnection studies and can cost your project up into the hundreds of thousands of dollars. You will need to weigh the results of conversations and studies to determine if it is worth moving on to the next phase of studies or if the cost of interconnection will not allow your site to be profitable. Most wind project developers choose to hire an engineering consultant to help them properly fill out the required forms, interpret study results, and to act as a liaison between the project, your Regional Transmission Operator (RTO), and the interconnecting utility. 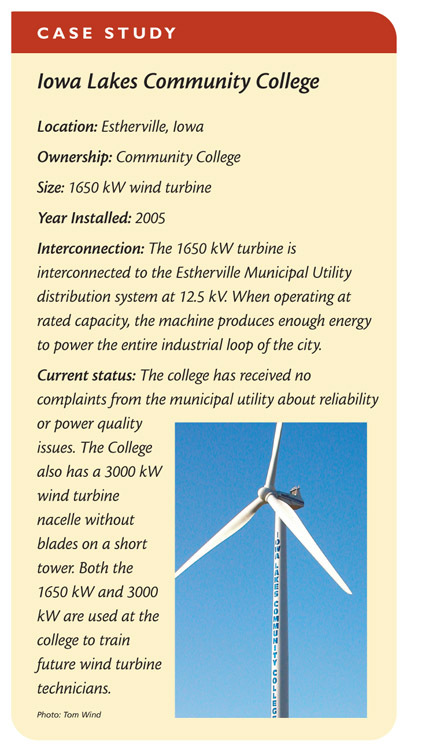 This section of Windustry’s Community Wind Toolbox is designed to help you through the process by breaking it down into stages and defining the key concepts and vocabulary you will need to understand while moving through the process. Interconnecting your project to the utility grid can be a long and complicated process. Below we have briefly summarized the principal steps in that process so you will know what to expect. These lines need to have enough available capacity to carry your power output, or you will have to pay to have the lines rebuilt or reconductored to a larger size which can handle the power from your project. 3. The final step is executing the agreements and constructing the additional infrastructure needed to get your energy on the grid. 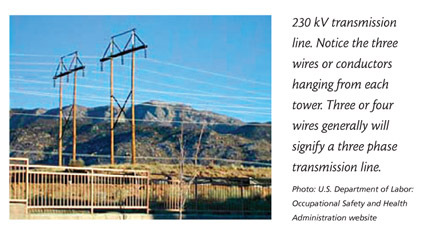 Look for three-phase power lines. Access to electric power lines is just as important as having a great wind resource in order to bring your energy to market. Just as a farmer cannot bring his 100 bushels of soy beans to market without roads and railways, your community wind project cannot deliver its energy to market without access to the electricity transmission and distribution system. You should begin the process of selecting a site for your project by looking for three-phase power lines in windy areas. If you cannot find land available for lease to develop wind energy that is close to transmission or distribution lines, it will probably be too expensive to interconnect your project. Depending on the capacity required, new power lines can cost anywhere from $50,000 to $200,000 per mile, a cost that will be added to your project budget. The U.S. Department of Labor: Occupational Safety and Health Administration has a great online guide illustrating generation, transmission, and distribution equipment in an easy to understand format. For one or two turbine projects, it is advisable to connect the project at distribution level voltages, which generally does not require the construction of a substation for the project. Connecting to the transmission system requires building a substation which can cost $1 million dollars or more. This added expense is often much too large for a smaller project to stay profitable. Larger projects will most likely have to connect to higher voltage lines because they require more electrical capacity than distribution voltage lines can provide. Is there space on the lines? Observing the location of three-phase power lines is very easy. 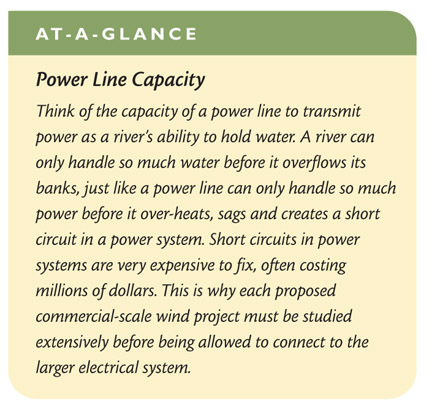 Determining if the lines have enough capacity to handle your power, however, is not clear from visual observation and comprises the lengthy and expensive part of the interconnection process. Once you have several sites picked out, talk with the local distribution utility to determine what voltage the lines are and who owns them. If the lines belong to the local distribution utility, often the distribution planning manager will have a good sense of how much energy is on the lines currently and may be willing to provide you with an initial indication of how much potential there is for adding your project to the local grid. Having early conversations with the utility about the size and type of project you are wanting to develop can help them advise you if there may be space for your project’s energy on the power lines in your area and can serve as a helpful litmus test for how receptive they will be to your request. 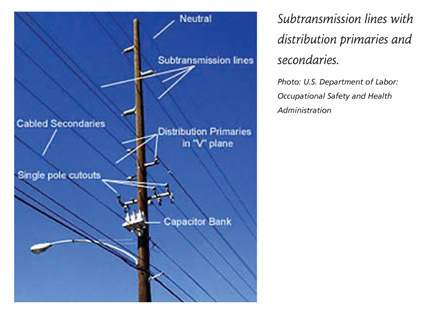 Smaller projects in the 0 to 10 MW size range will likely connect to distribution or sub transmission level voltage (12.5 to 41 kV, if one is near by) lines with simpler interconnection studies and technical criteria. Generally projects that are larger than 10 MW will need to connect to the higher voltage (above 69 kV) transmission system because there usually is not enough space on distribution lines to handle power from larger projects. It can help your project stay on the development track with minimal delays waiting for interconnection study results. Currently thousands of megawatts of wind projects are in some stage of most RTO interconnection study queues. There may be many wind projects in other windy areas also applying for interconnection. This can result in delays in study results, and can also result in your project not being able to connect to the existing lines because they may have been filled by applicants that are ahead of your project in the queue. Making contact early and being persistent lets the utility know that you are serious about developing your project, and that they should dedicate their stretched resources to aid in interconnecting your project. 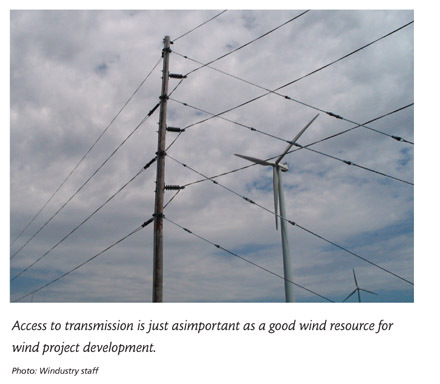 In many cases, interconnecting a project at the distribution level can be much easier, and less expensive, for a one or two turbine project than interconnecting at the transmission level voltages. Several states (California, Michigan, Minnesota, New York, Texas, Washington, and Wisconsin) have encouraged distributed generation and co-generation with supportive legislation and regulation because, in many cases, these resources have a lesser impact on the power grid and are less costly to interconnect than larger projects. Generally, it takes less time to plan and requires a simpler interconnection process for smaller projects. This can be good news for smaller community wind projects. However it is important to note that in some instances projects have been stalled or prevented from moving forward because utilities have instituted costly charges for the use of their distribution system to sell electricity. 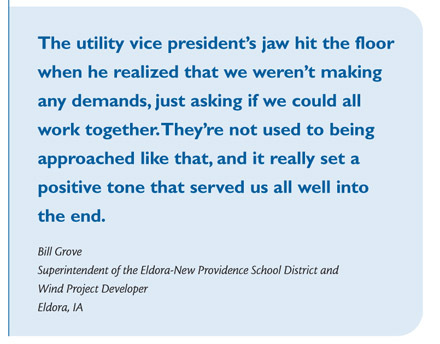 These system usage charges eventually caused the projects to terminate because it was impossible to negotiate a power purchase agreement that would provide a positive cash flow for projects. Most megawatt-scale wind projects have to begin an RTO process, but if your proposed project can meet state distributed generation interconnection standards and/or your RTO small generator interconnection criteria, then much of the expense and time associated with interconnecting can be avoided. To find out about expedited interconnection technical criteria and procedures, visit the "New Rules" website on Distributed Generation Interconnection Standards. Through the act of deregulation of the utility industry, RTOs were formed as a regulating agencies over the electric grid that are “independent,” from generation, transmission, and distribution companies. The RTO develops rules for the grid that comply with state and national regulations for power system safety, power quality, reliability, and operations, and performs studies for projects that wish to connect to the grid. These studies outline the impacts your project will have on grid power quality and contingency situations in case components in the power grid fail such as power lines, transformers, other generators, etc. The studies also outline what measures (installing new power lines, capacitor banks, fuses, switches, relays, breakers, etc.) must be taken to prevent your project from creating adverse impacts on the grid, and how much these actions will cost your project. This section briefly touches on each stage of the RTO interconnection process, so that you can begin to understand how to navigate through it. Generators that are greater than 20 MW in size OR generators that are requesting network resource status. Pay the interconnection request fee, which will go towards the total cost of the Feasibility Study to be performed in the next step. Either demonstrate site control or pay an additional fee if you do not yet have site control. After you have submitted the interconnection request, you will need to arrange a scoping meeting with representatives from your project, your RTO, and the affected transmission utilities. The purpose of this meeting is for the parties to discuss the details of the project; the estimated cost of the feasibility study; and schedules for payments, subsequent studies to be performed, reports to be filed, and agreements to be formed. Larger projects will be required to choose to be a network resource or just an energy only generator. A network resource can receive additional revenues from capacity payments for “accredited” capacity with the transmission organization. Typically for wind projects the default capacity rating is 20% of nameplate capacity. Choosing to be a network resource is often a good choice, but it will cost more for studies as well as require deliverability studies into the RTO footprint. The utility that wishes to purchase the energy from your project may want it to be considered a network resource. RTO staff will explain the option of network vs. energy resource in more detail, but it will be up to you do decide which route your project will take. After the initial scoping meeting, the RTO Feasibility Study will identify potential adverse system impacts resulting from the interconnection of your project, including a short circuit, thermal, and voltage analysis. This is the point where an electrical engineer with large power system experience can help you understand and negotiate the process of interconnecting your project. Making a deposit for the study. The system impact study will include a power flow, short circuit, voltage, stability, and system protection analysis. These analyses are similar to those brought forward in the feasibility study, but differ in that the results will include a preliminary indication of the cost and length of time that would be necessary to correct any problems identified in the analysis and implementation of the interconnection. For small projects this study may not be required. If it is required, it may cost anywhere from $500 to $50,000. It is very project-specific, depending upon your project’s potential for impacting the larger system as outlined in the feasibility study, and upon which study group your project is placed in. If the study is required the results will be made available to you according to the RTO interconnection schedule. It may take longer to receive study results, if your project proposes to interconnect in highly congested areas where many other generator interconnection requests have been filed. Large generator system impact studies have a similar time frame (45 calendar days according to the RTO schedule), but are likely to have a larger scope and be more expensive because a larger project has more significant potential impacts on the grid. The payment schedule for this study will be worked out in pre-study meetings that outline the details and costs of the study. The Facility Study will specify and estimate the cost and time schedule for the modifications needed to implement the recommendations from the System Impact Study. Small generators who want to interconnect may be required to deposit the entire estimated cost of the facility study. The time frame for returning results for this study runs from weeks to months. For large projects, the cost and payment schedule for performing this study will be determined in a pre-study meeting with the RTO, the affected utilities, and your project. A standard deposit amount is $100,000 for the facility study for projects above 20 MW in size. The time frame is not standard for large projects and will vary greatly depending on your project’s system impacts and required upgrades. It is good to plan some extra time in the project’s schedule in case this portion of the study takes longer than expected. Interconnecting projects may opt to perform an additional study to determine impacts of alternate system configurations or additional system costs or benefits from the project. This, like all of the other studies, will involve a scoping meeting and a financial deposit for the study. The required deposit and the payment schedule will depend upon the scope and estimated costs of performing the study. Executing the interconnection agreement is the final step, which involves agreeing to pay for system upgrades as outlined in the foregoing studies. Legal advice should be solicited as well as consultation from your project’s engineer to make sure that the stipulations of the contract are acceptable. Generally, the interconnecting utility will be responsible for performing all of the work to modify the electric grid to accept the power from your project. Your project, however, will be responsible for the costs of these upgrades, which can be substantial (in the hundreds of thousands or even millions of dollars). It is vital to examine all of the proposed upgrades to the system to make sure that they are directly associated with your project and not part of a pre-existing system condition that your project did not create. It should be noted that an interconnection agreement is not a power purchase agreement. A power purchase agreement is a contract signed between the power purchasing utility and qualifying generator for the sale of energy. Projects can move through the interconnection queue without a signed power purchase agreement. Some wind projects are currently being developed in deregulated power markets as merchant plants. Merchant plants sell their power into the spot electricity market at current market rates. This type of arrangement has the benefit of not having to negotiate a long term price for electricity that will make a project economically feasible, but has the risk of exposing the project to the sometimes volatile fluctuations of electricity market prices. Interconnection agreements in the RTO service territory for large generators/network resources are standardized, with the appendices filled in with information from the Facilities Study results. The standard agreement for large generators (greater than 20 MW) or generators requesting network resource status can be found at the RTO website. Currently, no standard small generator interconnection agreement exists. The agreement will typically be simpler than the Large Generator Interconnection Agreement but will cover many of the same stipulations. Contact your RTO for more information about small generator interconnection requirements. Once this process is complete, and your endurance has been tested, you are through with one of the most complex pieces of developing your wind project. Congratulations!